Milton (2016 census population 110,128) is a town in Southern Ontario, Canada, and part of the Halton Region in the Greater Toronto Area. Between 2001 and 2011 Milton was the fastest growing municipality in Canada, with a 71.4% increase in population from 2001 to 2006 and another 56.5% increase from 2006 to 2011. In 2016, Milton's census population was 110,128 with an estimated growth to 228,000 by 2031. The Mississaugas of the Credit held 648,000 acres of land north of the Head of the Lake Purchase lands and extending to the unceded territory of the Chippewa of Lakes Huron and Simcoe. In mid-October, 1818, the Chippewa ceded their land to the Crown in the Lake Simcoe-Nottawasaga Treaty and, by the end of October, the Crown sought to purchase the adjacent lands of the Mississaugas of the Credit. The Deputy Superintendent of the Indian Department, William Claus, met with the Mississaugas from October 27–29, 1818, and proposed that the Mississaugas sell their 648,000 acres of land in exchange for an annual amount of goods. The continuous inflow of settlers into their lands and fisheries had weakened the Mississaugas’ traditional economy and had left them in a state of impoverishment and a rapidly declining population. In their enfeebled state, Chief Ajetance, on behalf of the assembled people, readily agreed to the sale of their lands for £522.10 of goods paid annually. Significant municipalities found within the lands of the Ajetance Purchase of 1818 include Brampton and Milton. The town took root out of a settlement by Jasper Martin along the Sixteen Mile Creek; Martin immigrated from Newcastle upon Tyne, England with his wife Sarah and two sons on May 17, 1818. Martin was granted 100 acres (40 ha) of land, from the Crown in 1820, designated Lot 14, Concession 2, Township of Trafalgar, Halton County, in the District of Gore. Martin built a grist mill along the creek and created a pond, known as Mill Pond, to power his mill. The mill became the centre of settlement for others as they settled in the region. In 1837 the area had a population of approximately 100 people and was named after the English poet John Milton. The town, as it is today, soon after became known as Milton. The two principal property owners of the young town were the Martins and the Fosters. The current site of Milton's town hall was donated by Mr. Hugh Foster (and thus, it is called Hugh Foster Hall). By 1855, the United Counties of Halton and Wentworth split, and Halton became a separate county. Its council consisted of members representing the townships of Esquesing, Nassagaweya, Trafalgar and Nelson, along with Acton, Georgetown, Milton, Burlington and Oakville. Milton was then named as the county town (seat), a decision that certainly created a lot of local controversy. The people in Oakville were very upset because Oakville was an established place with a railway. Milton did not even have a railway, according to historian John McDonald. For 25 years there was this great rivalry. Every time county council tried to pass something to improve the Milton area, the Oakville councillors would often balk at it. A man named Hugh Foster donated 4 acres (1.6 ha) of land to the county to construct its administration building in Milton, which is still in place on Mary Street today and now used as the Milton Town Hall. Milton was incorporated into a town in 1857, after being chosen as county seat for Halton. By 1869, Milton had a population of 1,000. Records from 1874, indicate that Milton had county buildings, a telegraph office, a foundry, a tannery, a woolen factory, a grist mill and a saw mill, a weekly newspaper and a number of stores. In the early 1900s Milton was well known because of the P.L. Robertson Manufacturing Company, the first to make socket-head screws. Although formed in Hamilton in 1907, the business relocated to Milton in 1908. P.L. Robertson was the inventor of the square-socket drive for screws. In 1974, the present municipal structure was created when the Regional Municipality of Halton replaced Halton County. The new town of Milton added parts of the former township of Esquesing (most of this township comprises Halton Hills), all of Nassagaweya Township including the village of Campbellville, and the northern sections of Trafalgar and Nelson from (a 1962 annexation of the former townships) Oakville and Burlington respectively. With the addition of the Niagara Escarpment lands, tourism, recreation, and heritage conservation have increased in importance. The Halton Region Museum, which has a large number of historic agricultural buildings, and the Halton County Radial Railway museum are located in Milton, as is Country Heritage Park (formerly the Ontario Agricultural Museum). Five large parks operated by Conservation Halton reside in the town, and Mohawk Raceway is located near Campbellville. It is also home to Maplehurst Correctional Complex, the Vanier Centre for Women and one of two criminal courthouses serving Halton Region. On 1 January 2010, land was bought by the City of Mississauga and scaled down its border by 400 acres (1.6 km2) to Hwy. 407, affecting 25 residents. In 2015, the population numbers on all signs entering Milton increased to 100,000 based on official estimates by Town planners. According to the Canada 2016 Census there were 101,715 people living in Milton, and its population in 2006 was 53,939, representing an increase of 56.5%. The 2016 Census counted 32,452 housing units and 31,325 being occupied. The average population density per square kilometre was 2,520.3 persons. Age distribution indicated 32.5% of the population was 19 and younger, 59.1% of the population ages 20–64 and 8.4% 65 and older. The average total income of households in 2015 was $116,180. With one earner in a household, $60,829. Males had an average total income of $62,433 versus $42,328 for females. 24.0% of the population had completed high school as their highest education. 4.5% a Trades certificate or diploma. 21.6% College. 35.6% University. 11.8% of the population had not completed high school. As of the 2006 census, 17% of residents were a visible minority vs. 30% as of the 2016 census. According to the 2016 Census, English is the mother tongue for 60.6% of the population, down from 77.6% in the 2006 Census. However, the absolute number of native English speakers actually increased (61,180 in 2011, from 41,430 in 2006), but the increase in the absolute number of non-English native speakers was even higher, thus explaining the decrease in its relative proportion of English as mother tongue in the population. French is the mother tongue for 1.4% of the population. According to the 2016 Census, immigrant languages with the most notable proportions of native speakers are Urdu (8.0%), Arabic (2.9%), Spanish (2.5%), Polish (1.9%), Punjabi (1.9%), Filipino Tagalog (1.7%), Portuguese (1.4%), Mandarin Chinese (1.1%), and Italian (1.0%). According to the 2011 Census, the majority of Milton is Christian (64.6%), including Catholics (36.6%). 19.5% report no religious affiliation. Milton also has large Muslim (9.7%), Hindu (3.0%), and Sikh (1.9%) communities. The remaining 1.3% affiliate with another religion. Milton's Planning Department divides the town into communities. These divisions have little to do with politics and are based on traditional neighbourhoods. Old Milton Old Milton was built mainly between 1850 and 1890. Its boundaries are Bronte St S – CP Railroad Tracks – Thompson Rd – Robert St/Nipissing Rd. Beaty The Beaty neighbourhood started in 2001, this first homes to be built in "New Milton". Beaty is bounded by Derry Rd – Louis St. Laurent Ave – James Snow Pkwy – Thompson Rd. This neighbourhood was named for the Beaty Family who farmed in Trafalgar Township for more than a century. John Beaty emigrated from Ireland in 1820 and was one of the first settlers in the new survey. Between 1856 and 1857 Beaty held a number of offices and made an unsuccessful attempt to win a seat in the Provincial Legislature. John's son, William, became a pioneer of innovative agricultural practices. Bronte Meadows Bronte Meadows was constructed between 1982–1985. Its boundaries are Derry Rd – Bell St – Bronte St – Commercial St. This area is well known for its excellent tobogganing hill at Sixteen Mile Creek, as well as John Tonelli arena. Milton District Hospital and the Milton Sports Centre are found just on the other side of Derry Road. Bowes Bowes is a new neighbourhood being developed in south Milton in the Boyne Survey, which will add 6,000 new homes and approximately 25,000 new residents. Construction of this survey began in 2015. Bowes is bounded by James Snow Pkwy – Britannia Rd – Thompson Rd S – Louis St Laurent Ave.
Cobden Cobden is a new neighbourhood being developed in south Milton in the Boyne Survey, which will add 6,000 new homes and approximately 25,000 new residents. Construction of this survey began in 2015. Cobden is bounded by Thompson Rd S – Britannia Rd – Regional Road 25 – Louis St Laurent Ave.
Clarke The Clarke neighbourhood started building in 2003 and construction is still ongoing today. Clarke's boundaries include Derry Rd – CP Railroad Tracks – Thompson Rd – James Snow Pkwy. The neighbourhood was named after Samuel Clarke, a long time agriculturist and municipal politician. Clarke founded Milton's first newspaper The Halton Journal in 1855 and sold it nine months later to Rowe & Graham. Clarke was also a founding member of the Halton Agricultural Society, serving as its first Secretary-Treasurer until 1857. Coates The Coates neighbourhood began construction in 2005 and is bordered by Derry Rd – Louis St. Laurent Ave – Thompson Rd – Ontario St.
Dempsey The Dempsey neighbourhood began construction in 2002, bounded by Steeles Ave – CP Railroad Tracks – Thompson Rd – James Snow Pkwy. The Dempsey neighbourhood is named after John Dempsey, who emigrated from Ireland in the mid-1800s with his wife and 7 children. After arriving in Milton he built "Winding Sixteen Farm". Dempsey also opened a dry goods, grocery, and hardware store in the community. He also served as a member of the Milton Council in 1860 & 1861. Dorset Park Dorset Park, registered in 1973 by British residential construction firm Wimpey Homes, is named after Dorset County in Southern England. The neighbourdhood is bordered by Steeles Ave – Main St E – Ontario St & Thompson Rd. Fallingbrook Fallingbrook was built which was in the 1960s – the area is just South of Old Milton has quite a few heritage homes. It falls in the area south of Barton and Sydney Sts – east of the CN Railway tracks – west of Ontario St – north of Laurier Ave.
Ford Ford is a new neighbourhood being developed in south Milton in the Boyne Survey, which will add 6,000 new homes and approximately 25,000 new residents. Construction of this survey began in 2015. Ford is bounded by Bronte St S – Britannia Rd – Regional Road 25 – Louis St Laurent Ave.
Forrest Grove Forrest Grove is bounded by Ontario St – Milton Evergreen Cemetery – Sixteen Mile Creek – Parkway Dr E.
Harrison The Harrison neighbourhood, also known as Hawthorne Village South, was established by Mattamy Homes in 1999, with construction beginning in 2007. Hawthorne Village has been the best selling community in the Greater Toronto Area for five years (2007–2012), and is home to 3,500 families. The boundaries for Harrison are the CN Railway Tracks – Tremaine Rd – Louis St. Laurent Ave – Derry Rd. Mountainview Mountainview was named for the extensive views of the Niagara Escarpment from its most westerly vantage point. It was the first area built after the sewage plant was built in 1949. Mountainview is bordered by Steeles Ave – Woodward Ave– Bronte St N – Ontario St.
Scott The Scott neighbourhood is bounded by Tremaine Rd – Derry Rd – CN Railroad tracks – Main St.
Timberlea Timberlea sprung up in the 1980s and is bounded by Derry Rd – Main St E – Ontario St – Thompson Rd. Valleyview Valleyview is dominated by high-end homes on Valleyview Cres and is bounded by Ontario St – Laurier Ave – Sixteen Mile Creek. Walker Walker is a new neighbourhood being developed in south Milton in the Boyne Survey, which will add 6,000 new homes and approximately 25,000 new residents. Construction of this survey began in 2015. Walker is bounded by Tremaine Rd – Britannia Rd – Bronte St S – Louis St Laurent Ave.
Willmott Willmott District started construction in 2010 and will continue through 2014. Willmott is bounded by Louis St. Laurent Ave – Derry Rd – Ontario St – The Railway Tracks. 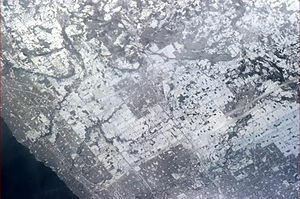 Milton, seen from the International Space Station, in late winter. This photograph was taken by astronaut Chris Hadfield, who grew up in Milton and is the namesake of Chris Hadfield Public School. In 2008, the town reached an agreement in principle with Wilfrid Laurier University for the latter to establish a satellite campus in Milton. Funding of $90 million for the Milton Education Village which would also include a Conestoga College satellite campus, on land donated by the town, was approved by the provincial government in April 2018. In October 2018 funding for the project was withdrawn by the new Ontario government (elected in June) before construction had begun. Mayor Gord Krantz indicated that the town would look for alternative funding. Milton is served by two library locations, a recently constructed Main Library located on Main Street East and Beaty Branch located on Fourth Line, which opened on November 17, 2009. A third library branch, Sherwood Branch, is scheduled to open in Spring of 2019. This branch will be located on Main Street West, near Tremaine Road and will help service the newer subdivisions in the west end of Milton. The historic Milton town hall in Victoria Park. The Town of Milton has a town council headed by a Mayor, and 8 council members. The town is divided into four wards, each of which elect a local council representative and a Halton Region council representative. Milton is represented by the mayor and four regional councilors on the Halton Region council. Krantz has been mayor since 1980 making him the current longest-serving mayor in Canada. E. Ross Pearen, Deputy Reeve 1953, Mayor 1956. At the provincial level of government, Milton is contained within the Milton provincial riding. At the federal level of government, Milton is contained within the Milton federal riding. Policing within Milton is provided by Halton Regional Police. Patrol of provincially maintained highways is provided by the Ontario Provincial Police. Milton is home to the Royal Canadian Mounted Police Toronto West Detachment under "O" Division. In 1972, the government started a $13.5 million construction project for the Maplehurst Correctional Centre which was completed in 1974. A $79-million makeover began in 1997 and was completed in 2001. Today, the site houses the Maplehurst Correctional Complex and the Vanier Centre for Women. The Rotary Club of Milton is a local service club and was chartered on January 22, 1947. The club has been active in helping the community for over 70 years, especially youth. One of its charter members was former Milton mayor Mike Ledwith. There are three main arterial east-west regional roads that run through urban Milton: #6 Britannia Road in the south, #7 Derry Road in central Milton, and #8 Steeles Avenue in the north. Three north-south regional roads bisect the town: Tremaine Road in the west; Highway 25 as Ontario Street through the middle of town linking Milton to Acton in the north and Bronte (Oakville) in the south; and James Snow Parkway in the east. A number of improvements have been undertaken since 2009 to increase capacity and alleviate delays due to congestion and train traffic on these numbered regional roads. Highway 401 bisects the Town and effectively separates the mainly rural and industrial areas to the north from the primarily residential and commercial developments in the southern part of town. A number of overpass and underpass projects have been constructed in recent years for the grade separation of railway crossings, including on Britannia Road, Derry Road, Main Street, and James Snow Parkway. Milton Transit is the municipal provider of bus services for the town. Milton Transit provides conventional and Milton access+ (paratransit) service, operating on weekdays and Saturdays, with connections to routes and GO Transit services at the Milton GO Station. Milton Transit has delivered service since the early 1980s in various forms. With recommendations from the North Halton Transit Strategy, Council approved the delivery of a contracted, fixed-route transit system in 2004. Milton Transit officially launched conventional service in August later that year and began purchasing its own branded buses in 2008. Milton Transit currently contracts its services to a private service provider, PWTransit Canada, who employ bus operators and maintain Milton Transit fleet. Intercity service is served by GO Transit via buses and trains. Commuter service to and from Toronto is the key routing, with some buses connecting to Oakville. On October 31, 2009, GO Transit started service with a line from Square One Shopping Centre in Mississauga to the University of Waterloo, therefore allowing a trip to Kitchener and Cambridge. Freight trains on the main Montreal-Toronto-Chicago CP line and a secondary CN line are a common sight in Milton. The town at present has very little passenger rail service in comparison to other GTA communities with only one-way, weekday peak-service inbound to Toronto in the morning, and outbound from Toronto in the evening. The nearest Via Rail station in the Toronto-New York City corridor is Oakville station. The most easily accessible GO Transit railway station is Milton station. The nearest airport to Milton is the Burlington Airpark in neighboring Burlington, Ontario. It is a thriving general-aviation field, but the airport does not have any regular commercial passenger flight service. Pearson International Airport, Canada's largest passenger-volume airport, is located only 37 kilometres to the east. Milton has a long sports history. In 2016, that history was formally recognized through a joint community-municipal project with the creation of the Milton Sports Hall of Fame. A volunteer committee was stuck in 2014. The inaugural class of inductees was announced in August 2016, with the formal induction ceremony set for November 24, 2016. A wall of fame to recognize the inaugural inductees as well as future inductees has been constructed in the Milton Sports Centre. E. C. Drury Spartans (wrestling – team). Milton Badminton Club operates up to nine courts within the in-field of the Mattamy National Cycling Centre. The club is officially affiliated with Badminton Canada and the Ontario Badminton Association, and actively participates in the district's league plays, junior circuits, as well as various Ontario tournaments. Programs are provided for players aged 9+ years old. Baseball has a long history in Milton, particularly in Campbellville where it had its beginnings with the Lumberman's Baseball Club as early as 1872. It really flourished as a "community tradition" in the 1920s and 30s, and again in the 1950s and 60s with the Campbellville Intermediate Baseball Team, which won numerous county and provincial titles in a 16-year span from 1952 to 1967. A grandstand and club house was erected in 1960 in Campbellville to make room for the 2,000 spectators that would descend on the hamlet. In 1953, the Campbellville Baseball Club won the OBA Intermediate C Championship in just its second year in the league, before repeating again and again. Managed by Len Andrews, the men's Campbellville Merchants baseball team won 11 consecutive Halton county league titles, as well as 12 Ontario Championship titles between 1952-1967, an amazing feat for a hamlet of 300 at the time. Known as the Merchants, the intermediate men's squad (1952-67 era) was inducted into the Baseball Ontario Hall of Fame in 2014. Campbellville teams won four more provincial titles between 1968 and 1984. Minor baseball in Milton was formally recognized through the incorporation of the Milton Minor Baseball Association as Baseball Milton in 1985. Programs range from junior t-ball all the way to midget, with house, select and rep leagues. Teams are known as the Milton Mets. In 2016, the Milton Mets major rookie team captured the boys' COBA Triple-A title. The Milton Stags are a youth basketball club and affiliated member club of Basketball Ontario and Basketball Canada. Milton Curling Club is a member-owned volunteer club with four sheets of ice and is open from October to April. Milton native Kirsten Wall is an Olympic gold medallist and served as Jennifer Jones alternate at the 2014 Winter Olympics. World Curling Tour curler Steve Bice also resides in Milton, and is second for the rink skipped by his brother Mark Bice. The Niagara Escarpment forms an excellent natural training ground for mountain biking and road cycling in Milton. Milton is also home to the Mattamy National Cycling Centre, opened in 2015, which includes the headquarters and practice facilities for Cycling Canada, as well as Canadian Cycling Hall of Fame. In 1978, Milton's 15-year-old Stan Fay became Ontario Junior Golf Champion. He also simultaneously won the juvenile crown as well. There are 10 golf courses within Milton. After Fay was diagnosed with Parkinson's, an annual charity golf tournament was established to help raise funds for the disease. Milton Springers Gymnastics Club have existed since 1974. In 1942, the Milton Bricks Tigers won an OHA Junior "C" title. Milton defeated Oakville to advance to the semi-finals and Parry Sound to move on to the finals against the Preston Riversides. In the Schmalz Cup best of three series, which was held at Maple Leaf Gardens, Milton won game one by a score of 6-4, with three goals coming from Milton's future NHL player Enio Sclisizzi, and game two by a score of 10-1. This victory came on the heels of a loss in the finals three years earlier versus Aurora. NHLer and four-time Stanley Cup champion John Tonelli is the most well-known hockey player to come from Milton. There is a Milton arena named in his honour. NHL referee Bruce Hood and linesman Leon Stickle are also Milton products. A banner hockey year came in 1976 when the Milton Tridents Intermediate B team won the Southern Counties league championship over the Tillsonburg Maroons in seven games, and the Docs and Dents minor atom team won the OMHA Central Ontario zone championship. The Docs and Dents were the first Milton minor hockey team to go undefeated in the Tri-County league, winning 26 games and tying two. The Milton Icehawks are a Junior "A" ice hockey team in the Ontario Junior A Hockey League. They are one of the most historical teams in the Ontario Junior Hockey League, having been formed in 1966. For the 2003-04 season, Forgione changed the team's name from the Merchants to the IceHawks to reflect the team's connection with the local minor hockey programs called the Winterhawks, and Forgione's ownership of the Mississauga IceDogs. In 2006, Forgione officially affiliated the Icehawks with the IceDogs. In the spring of 2006, ex-NHL goaltender Rick Heinz' attempt to purchase the nearby Tier-2 Junior Georgetown Raiders fell through, but by July 2006 the local Campbellville resident Heinz had talked Forgione into selling the Icehawks, and the affiliation with the IceDogs ended. Heinz sold the team just nine months later after starting the season with essentially no committed players. Dean Piett, a commercial real estate businessman from Burlington, and Rob DeVincentis, the Ancaster owner of a construction business, purchased the team from Heinz and have owned the team ever since the sale in 2007. Both Piett and DeVincetis had a son playing on the team in 2008, which led to friction amongst other players. The Icehawks (2003–present) have previously been known as the Milton Flyers (1979-1981), Milton Steamers (1981-1986), and Milton Merchants (1986-2003). Many notable players have suited up for Milton over the years including NHL stars John Tavares, Daniel Carcillo, Sam Gagner, Rich Peverley, Darren Haydar and Matt Read. Milton was represented by distance runner Ed Whitlock who held numerous age-related records for the marathon, half-marathon and long-distance track events, both indoor and outdoor. In 1976, Milton's Kevin Parker won a Canadian national novice skating title in London. The Niagara Escarpment forms an excellent natural training ground for skiing in Milton. It is also the site of Glen Eden ski area, where Olympian and Miltonian Travis Gerrits got his start. Milton soccer is represented by the Milton Youth Soccer Club. MYSC was incorporated in 1988 and has been serving the town of Milton ever since. It is a non-profit, volunteer organization. The club has over 3,300 players who play house-league, development and rep each year. Ages for teams range from U4 to U18 and including adult. Milton SC are currently representing Milton in the Canadian Soccer League after joining the league in the 2014 season. Milltown Football Club was a soccer club based in Milton, playing in Division 1 of the Peel Halton Soccer League. Milltown FC joined the Canadian Soccer League in the 2010 season as an expansion club but opted out of the league after one season due to disagreement over membership terms and conditions. The Milton Marlins are youth-focussed swim team based out of the Milton Sports Centre. Coach and swim trainer Carole Murray was instrumental in teaching thousands of kids in Milton how to swim from the 1970s until she sold her swim school in 2006. She won a coach of the year award from the federal government in 1988. She was also a coach for the Marlins. Under her watch Campbellville's Alicia Hicken competed in the Canadian Olympic Trials and Canadian Winter Nationals in 1991. Some Marlins swimmers have qualified for the Olympic Trials for the 2016 Rio Olympics. Every Labour Day weekend the Milton Steam-Era takes place. Steam-Era is the annual show produced by the "Ontario Steam & Antique Preservers Association," currently held on 88 acres at County Heritage Park, after decades at the Milton Fairgrounds. Steam engines from the 19th century puff their way around the grounds. Hundreds of tractors and stationary engines, along with antique cars, models and agricultural displays recreate life in the country 100 years ago. The Milton Fall Fair is held every year on the last weekend of September. The Fall Fair has been a tradition in the town for over 160 years. Events include: Agricultural show, midway, livestock, entertainment, the Demolition Derby and other traditional county fair events. The event takes place at the Milton Fairgrounds located in the historic downtown area of Milton. A farmers' market operates on Main Street in downtown Milton on Saturdays 8am-Noon, from May through October. The section of Main Street that hosts the market is closed off to vehicles during the event. The Downtown Milton Street Festival - annual event in June attracts over 90,000 people and includes live entertainment, vendors and local businesses. Miracle on Main Street - Tiger Jeet Singh Foundations'annual toy drive. The town has very easy access throughout the GTA by Highways 401 and 407 towards Oakville, Burlington and Hamilton on the town, or by the former Highway 25 (Halton Road 25). There are two key freight railway routes (both by CN and CP), passenger services from GO Transit, and Via Rail passenger connections in the Quebec City–Windsor Corridor in both neighbouring Oakville and Georgetown. There is close proximity to Toronto Pearson International Airport along Highway 401 (under 40 km from 401/Halton 25 exit). Residential growth has increased substantially over the past several years due to completion of "The Big Pipe" project; designed to deliver water to the town from Lake Ontario. Since this time, Milton has developed 7 new subdivisions, including Hawthorne Village, and several new ones are under development by Mattamy Homes and various other builders. Several new grade schools have been built as well as the Crossroads Centre shopping plaza that includes various major retail stores and restaurants. An eight screen movie theatre is operated by Cineplex Entertainment under their Galaxy Cinemas brand and opened on June 30, 2006. In July 2014, Milton council approved 11 applications that will see an additional 6,000 homes built, increasing the population by roughly 25,000 new residents. In 2013-14, Milton approved construction of a track-cycling veldrome venue for the 2015 Pan American Games called the Mattamy National Cycling Centre. The facility sits at the heart of a 150-acre plot of land that is designated for a proposed future Wilfrid Laurier University campus. The villages of Milton Heights and Peru are unique in Milton, as they were the centres of industrial rather than farming communities. This has given this part of Milton a unique character that has left a legacy in the buildings and people that remain in the area. In the 1850s and 60's until 1877, a lumber mill operated in the area as well as a saw mill in the mid-1800s. The railway fueled industry when it opened in 1879 in Milton. The area was traditionally famous for quarrying and the production of building materials such as lime, limestone and bricks, which started in the 1880s. These industries were of provincial significance and, at their peak at the turn of the 20th century, they employed hundreds of people in the Milton Heights and Peru areas. In addition, the materials that were produced here were used in many of the buildings in both urban and rural Milton as well as in buildings throughout Ontario. These were huge industrial operations for their time and they attracted considerable immigration to Milton. Early industry in Milton consisted of the Milton Pressed Brick Company, which started in the 1880s, and the P.L. Robertson screw factory, which started in 1908. ^ "Mayor and Council". Town of Milton. Retrieved 27 April 2016. ^ "Milton community profile". 2011 Census data. Statistics Canada. Retrieved 2012-02-08. ^ "Population and Dwelling Count Highlight Tables, 2016 Census". Statistics Canada. Retrieved 20 August 2017. ^ "Demonyms in Canada". Translation Bureau. Public Works and Government Services Canada. Retrieved 23 June 2018. ^ "Town of Milton: Canada's Fastest Growing Municipality". The Canadian Business Journal. Retrieved 12 February 2017. ^ "Portrait of the Canadian Population in 2006, 2006 Census" (PDF). Statistics Canada. March 2007. Retrieved 2011-10-13. ^ "Census subdivision of Milton". Focus on Geography Series, 2011 Census. Statistics Canada. Retrieved 12 February 2017. ^ "Milton Fast Facts" (PDF). Milton This Way Up. Archived from the original (PDF) on 27 April 2016. Retrieved 27 April 2016. ^ "The Town of Milton". Milton Historical Society. Retrieved 27 April 2016. ^ "Living in Milton, Ontario". Town of Milton. Archived from the original on 1 July 2006. ^ a b Hennessey, Melanie (22 March 2016). "Today marks Halton's 200th anniversary". Milton Canadian Champion. Metroland Media Group Ltd. Retrieved 27 April 2016. ^ McEvoy, Henry (1869). The Province of Ontario Gazetteer and Directory. Ontario: Robertson & Cook. p. 311. Retrieved 20 August 2017. ^ Crosby, Peter Alfred, ed. (1874). Lovell's Gazetteer of British North America. Montreal: J. Lovell. p. 195. Retrieved 20 August 2017. ^ "Plaque #7 : The P.L. Robertson Manufacturing Company". Historical Plaques of Halton Region. Archived from the original on 12 January 2017. Retrieved 20 August 2017. ^ "Annexation By-Law Given Quiet Passing". The Canadian Champion. Milton, ON. 6 December 1962. p. 1. Retrieved 20 August 2017. ^ "Court Services". Halton Regional Police Service. Archived from the original on 20 April 2014. Retrieved 27 April 2016. ^ "Home – Welcome to the City of Mississauga". Mississauga.ca. Retrieved 2010-07-27. ^ "Toronto 2025: Growth brings Milton prosperity, growing pains". CBC News. 26 March 2015. Retrieved 27 April 2016. ^ a b McKnight, Zoe (24 August 2014). "Milton Mayor Gord Krantz poised to become the next Hazel McCallion". Toronto Star. Retrieved 27 April 2016. ^ "Community Profiles - Milton, Town". Statistics Canada. Retrieved 27 April 2016. ^ a b "NHS Profile, Milton, T, Ontario, 2011". Statistics Canada. Retrieved 27 April 2016. ^ "Census Profile, 2016 Census: Milton [population centre]". Statistics Canada. Retrieved January 10, 2019. ^ a b c d e f "Urban Neighbourhood Map" (PDF). Town of Milton. 2011. Archived from the original (PDF) on 15 February 2016. Retrieved 27 April 2016. ^ "Old Milton". Century 21. Retrieved 27 April 2016. ^ "Beaty". Century 21. Retrieved 27 April 2016. ^ "Bronte Meadows". Century 21. Retrieved 27 April 2016. ^ a b c d "Boyne Survey Secondary Plan" (PDF). Town of Milton. 24 August 2015. Archived from the original (PDF) on 27 April 2016. Retrieved 27 April 2016. ^ "Clarke". Century 21. Retrieved 27 April 2016. ^ "Coates". Century 21. Retrieved 27 April 2016. ^ "Dempsey". Century 21. Retrieved 27 April 2016. ^ "Dorset Park". Century 21. Retrieved 27 April 2016. ^ "Harrison". Century 21. Retrieved 27 April 2016. ^ "Mountainview". Century 21. Retrieved 27 April 2016. ^ "Timberlea". Century 21. Retrieved 27 April 2016. ^ "Willmott". Century 21. Retrieved 27 April 2016. ^ "Milton mayor extremely "disappointed" with cancellation of $90M for Laurier campus". Inside Halton. Metroland News. 24 October 2018. Retrieved 25 October 2018. ^ "Doug Ford government cancels funding for post-secondary campus expansions in Brampton, Milton, Markham". Global News. Global TV. 23 October 2018. Retrieved 25 October 2018. ^ "About Us - Milton Christian School". Milton Christian School. Archived from the original on 2016-04-24. Retrieved 27 April 2016. ^ "Mayor and Council". Town of Milton. Archived from the original on 28 May 2012. ^ "Decision-making at Halton". Halton Region. Archived from the original on 28 May 2012. ^ Katherine DeClerq (23 Oct 2018). "Re-elected mayor of Milton continues reign as longest serving mayor in Canada". CTV News. Retrieved 18 Dec 2018. ^ a b "Milton's history is reflected in street names" (PDF). Canadian Champion. Milton, ON. 19 Nov 2004. p. 8. Retrieved 28 April 2016. ^ a b c d e f Illustrated Historical Atlas of Halton County, 1877. ^ a b c d e f g h i j k l m n o p q r "Milton's Walk of Fame" (PDF). Town of Milton. 2017. Archived from the original (PDF) on 22 August 2017. Retrieved 21 August 2017. ^ a b c d Challinor II, John; Dills, Jim. "History of Street Names" (PDF). Town of Milton. Retrieved 28 April 2016. ^ "Dr. Johnson E. Harrison. Reeve (1882), Mayor of Milton (1899)". Milton Images. Retrieved 28 April 2016. ^ "Milton' Oldest Voter". The Canadian Champion. Milton, ON. 6 December 1962. p. 1. Retrieved 20 August 2017. ^ "Milton Town Council 1930". Milton Images. Retrieved 20 August 2017. ^ a b "Five Former Mayors Were Present" (PDF). The Canadian Champion. Milton, ON. 14 June 1967. p. 3. Retrieved 20 August 2017. ^ "Adam E. Armstrong, soldier, office clerk, municipal politician, 1895-1957". Milton Images. Retrieved 20 August 2017. ^ "George H. Dawson, 1888-1955". Milton Images. Retrieved 20 August 2017. ^ "G. C. Gowland". Milton Images. Retrieved 20 August 2017. ^ "E. Rosslyn "Ross" Pearen. 1906-1975". Milton Images. Retrieved 20 August 2017. ^ McLachlan, Rod (4 March 2013). "Former Milton Rotarian, Mayor Shortlisted for School Naming". Rotary Club of Milton. Retrieved 20 August 2017. ^ "Sydney G. Childs, 1910-1981". Milton Images. Retrieved 20 August 2017. ^ "The Battle of the Ballots". The Canadian Champion. Milton ON. 3 October 1973. p. 1. Retrieved 20 August 2017. ^ "Anne J. MacArthur (nee Campbell) 1909-1998" (PDF). Milton Historical Society. Retrieved 20 August 2017. ^ Gentle, Irene (July 10, 1998). "First woman mayor is remembered as 'pioneer'". The Canadian Champion. Milton. p. 2. ^ "Gordon Toppled Krantz Mayor" (PDF). The Canadian Champion. Milton, ON. 12 November 1980. p. 1. Retrieved 20 August 2017. ^ "A $13,500,000 Project". The Canadian Champion. Milton, ON. 6 December 1972. p. 13. Retrieved 20 August 2017. ^ Gentile, Irene (5 May 2000). "Construction of mega-jail is on schedule". Canadian Champion (Milton, ON). Milton Digital Newspaper Archive. p. 5. Retrieved September 11, 2017. ^ "Main Street Grade Separation". Town of Milton. Archived from the original on 19 October 2012. ^ "Underpass construction begins on Derry Road in Milton". Halton Region. 11 June 2013. Retrieved 20 August 2017. ^ "About Us". Milton Transit. Retrieved 20 August 2017. ^ "Milton Sports Hall of Fame". Town of Milton. Retrieved 20 August 2017. ^ LeBlanc, Steve (6 May 2014). "Modest turnout for first meeting of Milton sports hall of fame". Inside Halton. Metroland Media Group. Retrieved 20 August 2017. ^ LeBlanc, Steve (4 August 2016). "And the Milton Sports Hall of Fame inductees are..." Inside Halton. Metroland Media Group. Retrieved 20 August 2017. ^ LeBlanc, Steve (20 January 2016). "Plans for Milton Sports Hall of Fame in full swing". Inside Halton. Metroland Media Group. Retrieved 20 August 2017. ^ LeBlanc, Steve (30 July 2017). "Inductees named for 2017 class of Milton Sports Hall of Fame". Inside Halton. Archived from the original on 4 October 2017. Retrieved 4 October 2017. ^ "2018 class named for Milton Sports Hall of Fame induction". InsideHalton.com. June 27, 2018. Retrieved March 25, 2019. ^ "Location & Schedule". Milton Badminton Club. Retrieved 20 August 2017. ^ Andrews, Leonard E. (2008). The Village Nine. Lulu.com. p. viii. ISBN 1435718690. Retrieved 20 August 2017. ^ "Cambellville Baseball" (PDF). The Canadian Champion. Milton, ON. 25 June 1954. p. C7. Retrieved 20 August 2017. ^ "Campbellville Wins Ontario 'C' Title : Crowds Cheers Welcome As Title-Bearers Return" (PDF). The Canadian Champion. 15 October 1983. Retrieved 20 August 2017. ^ "Campbellville Merchants and the summers of victory". The Hamilton Spectator. 29 November 2008. Retrieved 20 August 2017. ^ a b LeBlanc, Steve (16 October 2014). "Campbellville Merchants to be inducted into Baseball Ontario Hall of Fame". Inside Halton. Metroland Media Group. Retrieved 20 August 2017. ^ "Player registration". Baseball Milton. Archived from the original on 2017-04-01. Retrieved 2018-12-10. ^ LeBlanc, Steve (8 September 2016). "Rookie Mets capture COBA Triple-A title". Inside Halton. Metroland Media Group. Retrieved 20 August 2017. ^ "About Milton Stags". Milton Stags Basketball Club. Retrieved 20 August 2017. ^ "Milton Curling Club". Archived from the original on 21 August 2017. Retrieved 20 August 2017. ^ "Tour profile: Team Bice". World Curling Tour. Retrieved 20 August 2017. ^ "Steve Bauer, Curt Harnett among Canadian Cycling Hall of Fame's Class of 2015". CBC SPORTS. CBC/Radio-Canada. 11 October 2015. Retrieved 20 August 2017. ^ "Cycling Canada names 2015 Hall of Fame inductees". Cycling Canada. 16 September 2015. Retrieved 20 August 2017. ^ "Stan Fay captures Ont. golf crown" (PDF). The Canadian Champion. Milton, ON. 2 August 1978. p. B2. Retrieved 20 August 2017. ^ "7th Annual Charity Golf Classic for Parkinson's" (PDF). The Canadian Champion. 3 June 2003. p. 23. Retrieved 20 August 2017. ^ "Milton Springers Gymnastics Club". Retrieved 20 August 2017. ^ "Hockey : Milton 11 Parry Sound 3". The Canadian Champion. Milton, ON. 26 March 1942. p. 3. Retrieved 20 August 2017. ^ "Milton Wins Ontario Championship". The Canadian Champion. Milton, ON. 2 April 1942. p. 2. Retrieved 20 August 2017. ^ "Hockey : Aurora Consols Junior Campions". The Canadian Champion. Milton, ON. 6 April 1939. p. 3. Retrieved 20 August 2017. ^ a b "Highlights of the 1976 Sporting Year : Kevin Parker, Docs and Dents lead parade". The Canadian Champion. Milton, ON. 29 December 1976. p. 17. Retrieved 21 August 2017. ^ "Milton Icehawks Jr. A Hockey Club". Archived from the original on 2017-08-21. Retrieved 21 August 2017. ^ LeBlanc, Steve (26 March 1999). "Merchants, Scouts and Resource Centre nominated for Organization of the Year" (PDF). The Canadian Champion. Milton, ON. p. 3. Retrieved 21 August 2017. ^ LeBlanc, Steve (15 March 2005). "IceHawks up for sale, Forgione considering offers". The Canadian Champion. Milton, ON. p. 17. Retrieved 21 August 2017. ^ LeBlanc, Steve (22 June 2001). "Grant sells Jr. Merchants to Oakville trio". The Canadian Champion. Milton, ON. p. 22. Retrieved 21 August 2017. ^ LeBlanc, Steve (17 June 2003). "Sweeping changes for local Jr. A club". The Canadian Champion. Milton, ON. p. 21. Retrieved 21 August 2017. ^ LeBlanc, Steve (14 March 2006). "Hawks to officially affiliate with IceDogs". The Canadian Champion. Milton, ON. p. 15. Retrieved 21 August 2017. ^ LeBlanc, Steve (7 July 2006). "It's official, Heinz buys IceHawks". The Canadian Champion. Milton, ON. p. 18. Retrieved 21 August 2017. ^ LeBlanc, Steve (30 March 2007). "IceHawks to be sold". The Canadian Champion. Milton, ON. p. 19. Retrieved 21 August 2017. ^ LeBlanc, Steve (3 December 2008). "Things not exactly rosy in IceHawks' nest" (PDF). The Canadian Champion. Milton, ON. p. 19. Retrieved 21 August 2017. ^ "About MYSC". Milton Youth Soccer Club. Retrieved 21 August 2017. ^ "April 17, 2014 CSL--Milton Deserves to be on the Canadian Soccer Map (from CSL media release)". www.rocketrobinsoccerintoronto.com. Retrieved 2018-08-08. ^ "Milltown FC Roster Set For Opener". NukeSoccer.com. May 14, 2010. Archived from the original on November 24, 2017. ^ "Milltown FC Opts Out of Canadian Soccer League". MilltownFC.com. 22 February 2011. Archived from the original on 26 March 2012. Retrieved 4 July 2011. ^ "Milton Marlins Swim Team". Retrieved 21 August 2017. ^ "New name for longtime swim academy". Inside Halton. Metroland Media Group. 2 December 2010. Retrieved 21 August 2017. ^ Townsend, Murray (3 November 1993). "The fire of fear becalmed in the water" (PDF). The Canadian Champion. Milton, ON. p. 17. Retrieved 21 August 2017. ^ "Winter Nationals 1991" (PDF). SWIM Canada Magazine. March 1991. pp. 8–11. Retrieved 21 August 2017. ^ "Alicia Hicken-Franklin". Denver Pioneers. Retrieved 21 August 2017. ^ "Marlins make waves". Inside Halton. Metroland Media Group. 29 December 2015. Retrieved 21 August 2017. ^ a b c The Corporation of the Town of Milton (28 May 2012). "Report : An outline of the history and characteristics of the Milton Heights and Peru Character Areas of Milton" (PDF). Town of Milton. Retrieved 21 August 2017. ^ "Robertson Inc. : About Us". Robertson Inc. Archived from the original on 7 August 2017. Retrieved 21 August 2017. ^ "Mattamy Homes : Halton/Hamilton Divisional Offices". Mattamy Homes. Retrieved 21 August 2017. ^ "Milton - Top Employers" (PDF). Milton This Way Up. The Corporation of the Town of Milton. Archived from the original (PDF) on 2017-08-21. Retrieved 21 August 2017. ^ a b c "Investment Profile : Top Employers". Milton This Way Up. The Corporation of the Town of Milton. Archived from the original on 2017-08-21. Retrieved 21 August 2017. ^ Hounsell, Stephanie (1 February 2008). "A story of faith" (PDF). The Canadian Champion. Milton, ON. p. B1. Retrieved 21 August 2017. ^ "Deadmau5 Purchased This Beautiful $5 Million House In Canada". EDM Sauce. EDM Sauce, LLC. 10 October 2014. Retrieved 21 August 2017. ^ Slack, Julie (6 November 2015). "Deadmau5 entertains Milton students, encourages creativity". Inside Halton. Metroland Media Group. Retrieved 21 August 2017. ^ "Popular electronic-dance musician Deadmau5 inspires Milton District High School students". Halton District School Board. 13 November 2015. Archived from the original on 4 March 2016. ^ "Deadmau5's condo is for sale, and this is what it looks like inside". Toronto Life. Toronto Life Publishing Company. 4 June 2015. Retrieved 21 August 2017. ^ Slack, Julie (21 April 2015). "New Toronto Police Chief Mark Saunders a former Milton resident". Inside Halton. Metroland Media Group. Retrieved 21 August 2017. ^ "Darren Haydar hockey statistics and profile". HockeyDB.com. Retrieved 21 August 2017. ^ "A look at some key members of the 1960-61 Chicago Black Hawks". The Hockey News. TVA Group. 31 May 2010. Archived from the original on 25 April 2016. Wikimedia Commons has media related to Milton, Ontario. Wikivoyage has a travel guide for Milton (Ontario). This page was last edited on 25 March 2019, at 14:12 (UTC).